In light of Mark Gatiss’ win of Supporting Actor in a Play at the What’sOnStage Awards, here’s a review of the play and role that led to his victory. The tag-line for Patrick Marber’s Three Days In The Country looks so simple: Summer Love. But the play, which is a shorter version of Ivan Sergeyevitch Turgenev’s A Month In the Country and currently playing at the National Theatre (Lyttelton Theatre), is so much more than a simple romance. Set on a Russian country estate, in the mid-nineteenth century, this play explores love and lust in all its forms from unrequited to forbidden, and finds comedy in everyday life. John Simm (Life on Mars, Doctor Who, Prey) stars as Rakitin, who has been invited to spend the summer at the country house of his friend Arkady (John Light) and his wife Natalya (Amanda Drew). Unbeknownst to his friends, Rakitin has been in love with Natalya since they met twenty years earlier. John Simm is in top form, wandering that edge between forbidden desire and despair. Natalya is trapped in her loveless marriage, and the arrival of her son Kolya’s new, handsome tutor Belyaev (Royce Pierreson) stirs up life in the country quite a bit when not only Natalya, but also her ward Vera (Lily Sacofsky) and the maid Katya (Cherrelle Skeete) are fascinated by him. It quickly becomes clear that unrequited love is a common phenomenon, no matter which level of society you belong to. 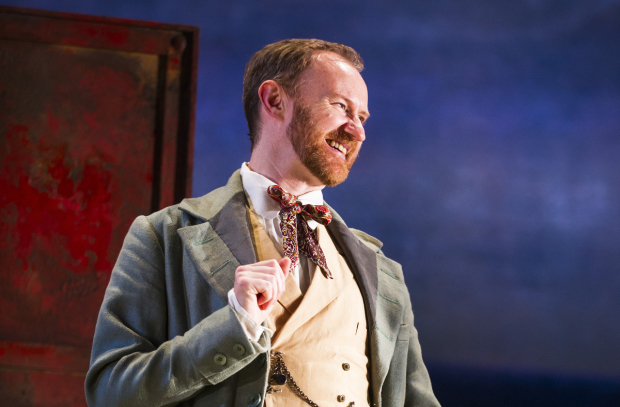 It is Mark Gatiss, however, who emerges as the master of comic timing in this play as he takes on the role of the morose Dr Shpigelsky. Shpigelsky’s proposal to spinster Lizaveta (Debra Gillett), in which Gatiss not only crawls around with back pain, but also lists all his absolute worst qualities while keeping a straight face, is comedy gold. It does need an actor of Mark Gatiss’ calibre to pull it off, with some of the finer nuances of his portrayal having more impact than the grand gestures. This scene alone would make it worth the admission fee, and deserves all the applause it gets. Gatiss further surprises by flawlessly singing a Russian folk song, although the standout voice in this production is that of Cherrelle Skeete, whose vocal range is impressive. The slanted set is positively spartan, allowing the audience to focus on the action. Dominated by a painted background of Russian countryside and one huge red door, there is little to distract attention. All actors not in the current scene, however, sit around the edges of the set. This is the only flaw in this production, as a character, who is called for on stage, might be visible, sitting on the sidelines yet not interfering as the character is not yet part of the scene. Three Days In The Country is not a grand romance. It’s a play about people who are – for the most part – unaware of the feelings of those around them. Drama and humour go hand in hand in this production and you soon realise the tag-line is spot on after all: Summer Love.